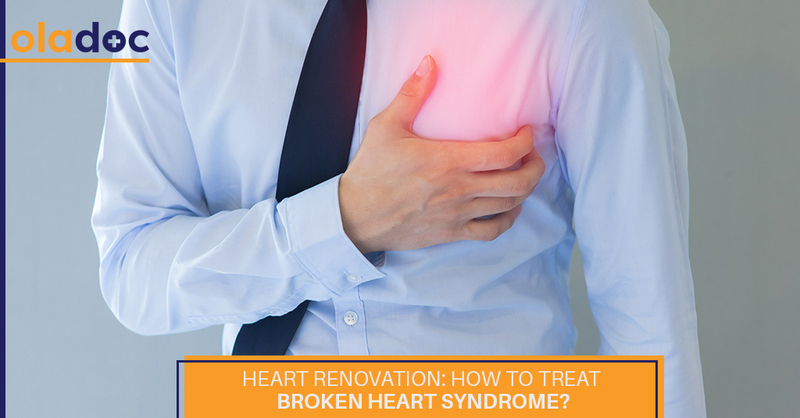 Home » Mental Health » Heart renovation: How to treat Broken heart syndrome? Heart renovation: How to treat Broken heart syndrome? Broken heart syndrome refers to a condition in which one part of the heart has abnormal function while the rest of the heart works in its normal fashion. The condition happens abruptly but the symptoms are temporary, and the heart goes back to normal function within a few days. There is no confirmed reason for broken heart syndrome, but stressful events have been found to trigger it. It has been speculated that an abrupt increase of stress hormones in blood causes disturbance in blood flow in some areas of the heart which can create heart attack like symptoms. In the paragraphs to follow, this article explains symptoms, triggers and treatment options for a broken heart. The symptoms for a broken heart also known as stress cardiomyopathy are very similar to a heart attack and are as following. Patients are likely to experience tightness in the chest with sharp pain which often starts after an overwhelming news or experience. Difficulty in breathing can also be experienced during an episode. There are also some risk factors which make certain people more vulnerable to develop broken heart syndrome. It has been found that women are more vulnerable as compared to men. People older than fifty and people suffering from mental issues such as depression or neurological disorders are at a high risk of developing this syndrome. Although there are only two common symptoms of a broken heart syndrome, many events as listed below can trigger these symptoms. Performance anxiety which is often experienced during big presentations or stage performances is also likely to bring about an episode of broken heart syndrome. Stress has been found as the root cause of the broken heart syndrome, thus people who are at higher risk of developing the condition should avoid highly stressful environments. If there are any overwhelming news such as death of a loved one, then such news should be delivered in a patient and calm way. Although heart attack is caused by blocked arteries and broken heart syndrome occurs because of stress, the medication used in treatment of both conditions are similar. The patient is hospitalized and are usually put on doses of beta blockers and angiotensin enzyme inhibitors. The surgical procedures used generally in heart attack patients such as an angioplasty is not necessary as arteries work normally in broken heart syndrome. If you or a loved one is experiencing or has recently experienced symptoms of a broken heart, you should visit a cardiologist as soon as possible. You can visit our website oladoc.com to read up on different cardiovascular conditions and look for specialists in Lahore, Karachi and Islamabad. You can also call our helpline at 042-3890-0939 to get directed to the specialists that are suitable for your specific concerns.